Supper at the cottage is always an informal affair. We often come to the table in bathing suits (if we’re not freezing after coming out of the lake), or wrapped up in sweaters and woolly socks when the evening turns chilly. 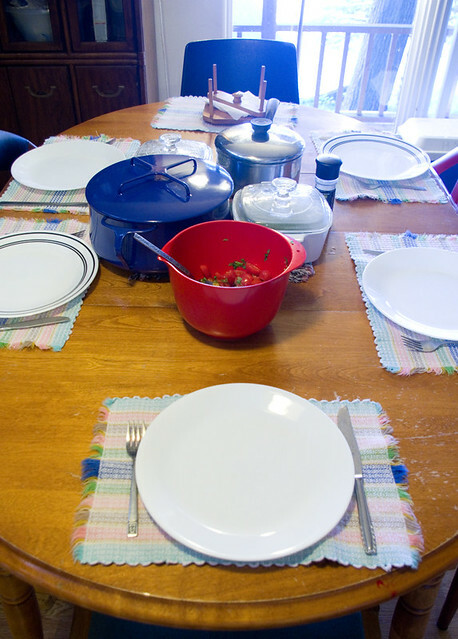 Food is often served directly from the stove, but this day we were feeling especially fancy, so we placed on the table in the dishes they were cooked in. The main part of this dinner was an easy dish that my family has always tongue-in-cheek called “slop”. Basically, you fry up some onions and garlic (or in this case, garlic scapes), add ground beef (or a ground beef/ground chicken/ground turkey mixture, depending on what we have on hand), frying until browned. Drain off the grease, add a can of cream of mushroom soup, and a can of water. Optionally, you may add cooked frozen vegetables to the mixture at this point. Boil down the soup mixture until it has the consistency of a thick gravy. Serve the meat mixture over mashed potatoes or rice. 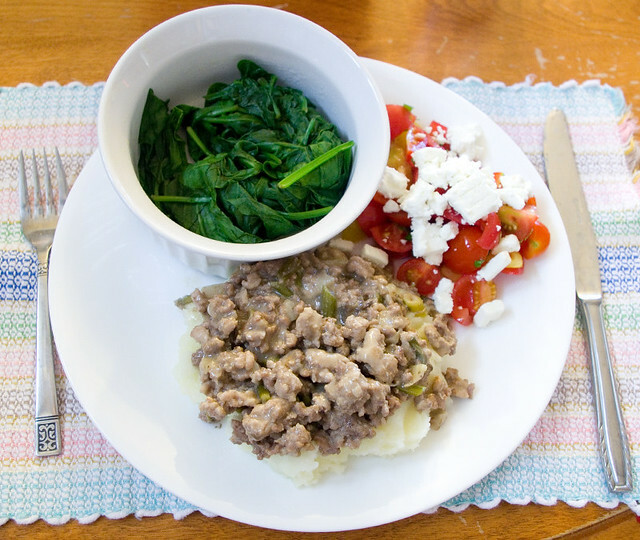 This time we served slop with a number of vegetables on the side; I had cherry tomatoes with basil, topped with goat cheese, as well as steamed spinach. We also served Brussels sprouts and broccoli, both steamed. Posted on August 23, 2017 August 21, 2017 by owntwohandsblogPosted in CookingTagged beef, casual, cottage, dinner, easy, food, gravy, mushroom, slop, spinach, supper, tomatoes. Next Next post: But What Is It?